Before anyone gets too excited, I'm first going to say that I believe this is yet just another tease for fans in Rochester that would like to see an MLS team play in PAETEC Park. But, there is a new team that has someone throwing out a potential move to Rochester in response to a push for a publicly funded stadium hitting a bump in the road. 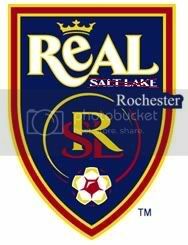 The Desert Morning News is reporting that that Salt Lake City mayor Rocky Anderson has told the Salt Lake City city council that investors from Rochester, NY and St. Louis are actively making bids for Real Salt Lake due to the club's push for a publicly funded stadium hitting a major roadblock this week. Now this is far from Rochester's first time down this road. There were reports that the Hunt Sports Group was in talks with the Rhinos ownership in regards to moving their franchise in Dallas, then known as the Burn, to Rochester just prior to the public funding for Pizza Hut Park in Frisco, Texas got approved. And more recently Rochester has come up in rumors about a possible landing place for the Kansas City Wizards, also owned by the Hunt Sports Group. HSG has been trying to sell the Wizards to a local ownership group that has plans to build a soccer stadium in the Kansas City area. But, that deal has yet to be completed despite being in the works for over a year. Given that Real Salt Lake owner Dave Checketts just purchased the St. Louis Blues of the NHL, my first inclination would be that St. Louis would be the landing place for the team should they in fact leave Utah. St. Louis has a rich soccer tradition and would appear to be a potentially great MLS market. Plus, it would allow Checketts to build a mini-pro sports empire in the market. But, I'm always up for some daydreaming about an MLS team in Rochester. Although, this dream isn't the greatest one I could have. I'd much prefer to dream about the Kansas City Wizards coming to Rochester. Not only do the Wizards have US National Team forwards Eddie Johnson and Josh Wolff, but they also have US National Team defender and media darling Jimmy Conrad. Add in the fact that Real Salt Lake has Jason Kreis on their roster and that they haven't had a whole lot of success in their season+ in MLS and I can't get too excited about what Rochester would be getting if they were to move here. Granted it's raining like cats and dogs, but tonight is the night that the Rhinos enter this year's Lamar Hunt US Open Cup versus the new Hampshire Phantoms of the USL 2nd Division. Personally, I love the Open Cup. I love seeing MLS teams come to town. I love venting about MLS teams not taking the Open Cup seriously. I love match ups like last year's game versus the Chicago Fire where the MLS team does take it seriously and the Rhinos stand toe to toe with them for ninety minutes or more. And tonight's game is HUGE as the Rhinos will host the New England Revolution on August 2nd should they win tonight. I want to see Clint Dempsey, Pat Noonan, Taylor Twellman, Matt Reis, and the rest of the Revolution come to town. Although, knowing Revolution head coach Steve Nicol, the Rhinos probably won't see the Revolution's A squad if they are fortunate enough to advance. At the end of last Saturday's Kick This!, Rhinos head coach Laurie Calloway mentioned that the Rhinos are in talks about potentially trading for a 31yo foreigner that could play the #10 central midfielder role that has been an issue with the season ending knee injury to Jonathon Bolanos and the potentially season ending groin injury suffered by Juninho DaSilva. Then on the post game show following the Rhinos game versus Charleston, Calloway mentioned that he had been talking to an agent of a Central American player about possibly filling that role.